I’ve mentioned before that the Convent has a history of having wonderful roses, with the nuns maintaining trellises of showy roses. This is a bit of a lazy blog. I’m just going to list the roses at the Convent here and will update it as I plant more, just so I discipline myself to write them down. 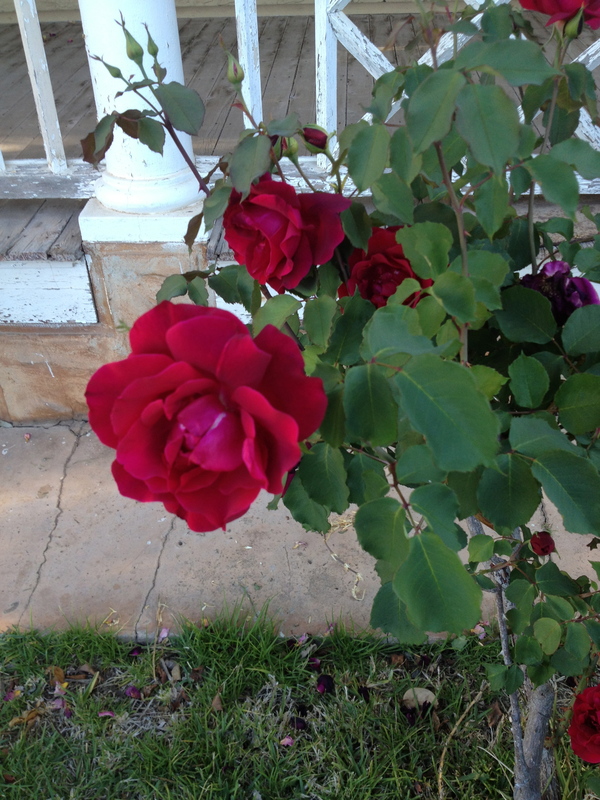 Good Samaritan – deep crimson and obviously the signature rose for the Convent. There are two standards at the step of my back porch that I planted and two of the older original roses out front also seem to be the same. Pierre de Ronsard – blowsy dusk pink and prolific flowerers. They should look great against the original unpainted cement block garage wall. I had them in a previously life and miss them. They are a beautiful rose and climb well. I also have a newer variety of Burgundy in a Floribunda out the front of the Chapel as well as a Blushing Pierre de Ronsard – very pale, with tinges of pink as it ages, to climb over the Grotto. Duchesse de Brabant, bought under the advice of L and a lovely very old rose species. Planted next to the cyclone fence on Sister Kath’s side – I hope it climbs. Climbing Icebergs x 2. Both on the back wall which in time should be covered with Passionfruit and climbing roses, if the grand plan works out. Six standard Icebergs as sentinels lining the front path to the entrance. Crepuscule – a gorgeous and voracious climbing pale apricot. It has already outpaced all the other roses, despite being a victim of the artist fence accident. Now has a new climbing home on the recently built cyclone fence section. Lamarque – a gracious old rambling white rose in the back garden bed – yet to kick in and I have great expectations of. Cecile Brunner – pink buttonhold climber of course, on the back wall and already taking off as well as one on the Grotto. Pinkie – an old fashioned favourite and prolific climber that is one of the Grotto roses. Cottage White Climbing Multiflora, to partner the other side of the Grotto. 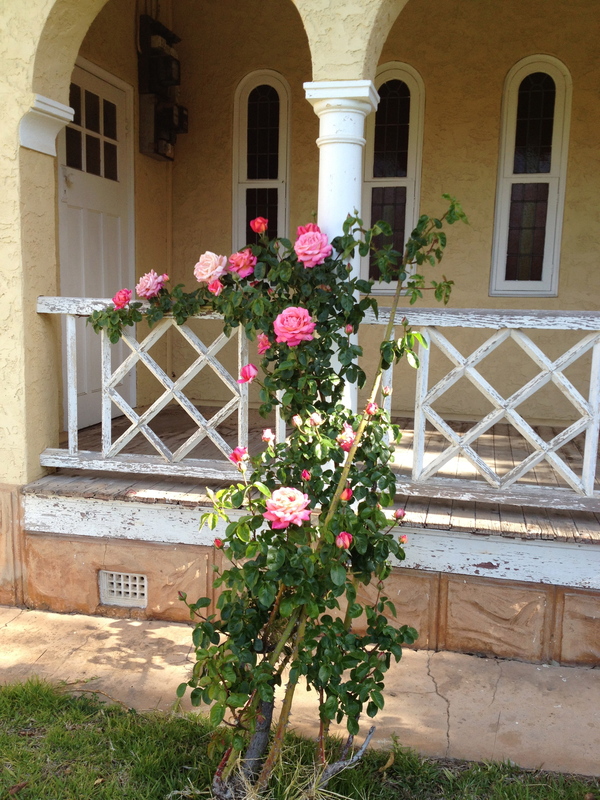 Champion – tiny roses in pots on the Chapel verandah. The Fairy – a pink groundcover that loves to trail and strike itself along the back porch area. This is so successful, I’m thinking of planting it all that side of the house. Dream Weaver – hopefully true to its name as a rambler – pink, on the front wall. Atomic Blonde – a newer white variety from Swanes that I hope will be a wanderer along the newly replaced cyclone fence. Mme Alfred Carriere – another pale climber on the back wall. David Austen Molineux – a yellow in the back garden bed. David Austen Graham Thomas – a yellow climber on the back wall which is supposed to be one of the lovelier yellow roses. Two climbing Mister Lincolns in deep red on the front wall. Another two have been planted on the Church side of the wall. An Albertine – classic pink on the front wall. Mme Isaac Perriere – supposedly a rampant deep pink rose and named after a rather buxom aristocrat. I tend to think she may be one of the “personality” roses and is planted in an area on the front wall that could do with some cheering up. Peace – a classic in a Hybrid tea rose out the front of the Chapel. Fruitee – a deep orange Floribunda planted at the front of the house with the old roses. Jude the Obscure – a lovely pale creamy apricot arching David Austen bush. Queen Elizabeth – a pink shrub rose. Elina – A cream hybrid tea rose. Renae – a pink thornless climber on the front wall. St Cecilia – a pink David Austen bushy shrub. A plethora of little carpet roses and tiny garden roses from Bunnings – white, red and yellow, all of which are nameless but work hard at flowering. About half a dozen lovely old rose bushes that have survived for many years, but I have no idea on their variety. It’s still way too cold to prune but I’m looking forward to seeing how well all the roses develop and grow once the weather warms up.